1. In a large fry pan over medium heat, warm the oil. Add the onions and the 1 tsp. salt and cook, stirring occasionally, until the onions are golden brown, about 30 minutes. Transfer to a large bowl and let the filling cool to room temperature. 2. In the same pan over medium heat, melt the butter. Add the apples and sugar and stir to coat the apples. Cook, stirring, until the apples are just starting to caramelize and have softened, about 10 minutes. Transfer to the bowl with the onions and stir in the cheese, chives, thyme and the 1/8 tsp. pepper. 3. 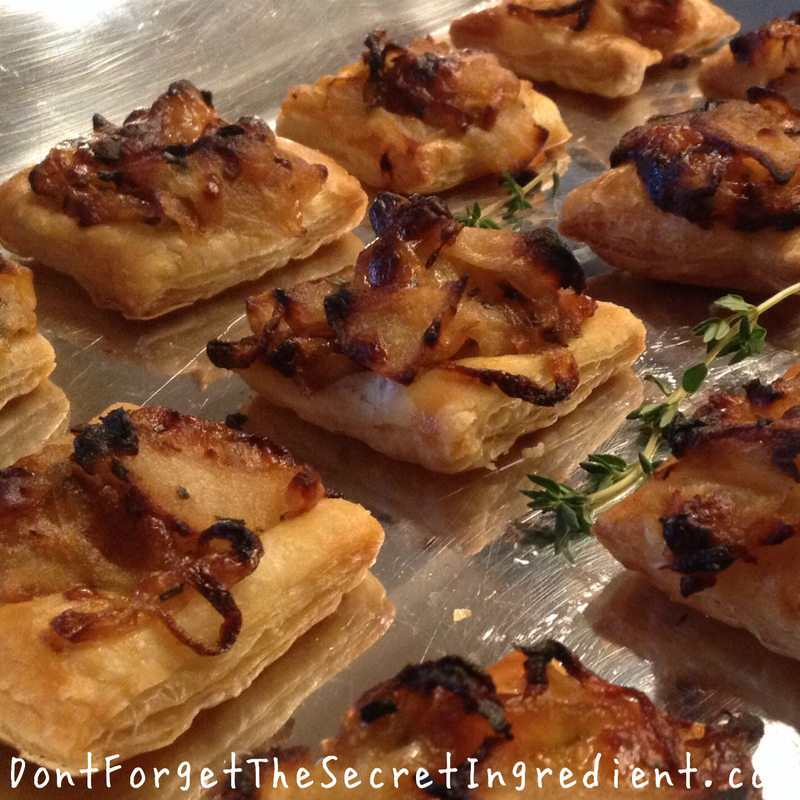 Cut the puff pastry into 2-inch squares and place on the prepared baking sheets, spacing the squares about 1 inch apart. Brush the pastry squares with the egg mixture and place a heaping 1 Tbs. filling in the center of each square. Season with salt and pepper. 4. Position one rack in the upper third and one rack in the lower third of an oven and preheat to 400°F. Line two baking sheets with parchment paper. 5. Bake, rotating the baking sheets from top to bottom and front to back halfway through baking, until the pastry is crisp underneath and golden brown on top, about 22-25 minutes. Transfer the baking sheets to wire racks and let the tarts cool to room temperature. Serve at room temperature. Makes 32 tarts. Pssst! You can prepare the tarts a few hours early (steps 1-3) and then cook them just an hour before you plan to serve them.